Please help me welcome Anne Barwell! She’s here to talk about her latest release, On Wings of Song, and some of the history behind it. 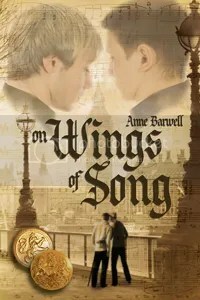 Although On Wings of Song begins with the 1914 Christmas Truce, most of the story takes place six years later in 1920. People were still coming to terms with their experiences during the war. Those who hadn’t fought had still lost someone they cared about, or had them return either maimed or a very different person than had left to fight at the Front. Toward the end of the war, in 1918, the influenza epidemic struck, killing more people than the war. In Germany people were starving. Inflation coupled with the debt incurred by the Treaty of Versailles, was also taking its toll. In Britain the war had begun to break down some of the class barriers, at least for some, although for others it wasn’t about to change anytime soon, if ever. It was also time of growth and relative prosperity, as the economy broke down later there, in the late 1920s. So how to get Jochen—a German—to Britain in 1920? One of my betas and I were discussing this over tea break at work one day, and a colleague suggested the solution. Enter his great-aunt Wilhelmina, the black sheep of the Weber family who had married a British man and settled there. She dies and leaves Jochen an inheritance. But anti-German feeling is running high, and while Jochen’s English is excellent, his accent gives away his origins. Dealing with that on top of post war trauma is not easy—it’s not meant to be. Aiden’s injuries might be physical as well as psychological but that does not mean that Jochen has escaped the war unscathed. One of the reasons I wrote On Wings of Song is that I wanted to show both sides of the war, rather than take sides one way or the other. No one truly wins a war and huge costs are paid by both sides. The 1914 truce reminded each side of a shared humanity. This story brings together two men who find they have a lot in common despite having fought a war on opposite sides. This entry was posted in For Your Reading Pleasure and tagged Anne Barwell, Dreamspinner Press, Guest Author, historical, MM Romance by Charley Descoteaux. Bookmark the permalink. Thanks again for hosting me, Charley.